A husband and a wife get a divorce, but decide to re-marry later. 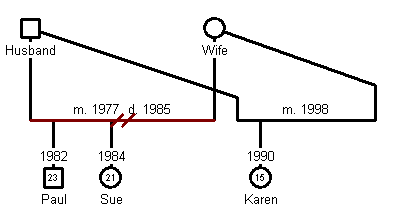 To document this situation in a genogram, you treat each marriage as a different family. By looking at the sample, Paul and Sue were born during the first marriage and Karen during the second marriage. The easiest way to create the second marriage is to use the Family Wizard and then re-link the husband and wife from the first marriage to the second marriage. Use the right-click of the mouse and select "Link As Parent" to activate the links. GenoPro also provides a mechanism to distinguish a divorce from an annulment.